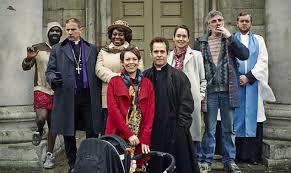 Image: The cast of the British television series "Rev." Note: I usually make it a practice to be very careful when I commend or even mention any films or television shows in my speaking or writing. One reason is that I know that the entertainment and recreation one person might have liberty of conscience to partake of another might not allow, and vice versa. We let our children play team sports, for example, namely baseball, but we have some friends who would not do this. We rarely let our children play video games (other than a few Wii games), while other Christian families we know allow for more than we would. Similar things might be said for various other forms of entertainment and recreation. …. As you know, I rarely watch much television, other than PBS. I usually prefer to spend an evening at home either reading or writing. I do, however, have a liking for some British television shows which I occasionally watch on Hulu, including “Doc Martin” and the old “Inspector Morse” series. Last year I ran across a British situation comedy called “Rev.” that I started to watch. The show tells the story of an inner city Church of England priest named Adam Smallbones, played by Tom Hollander, who is also the co-creator and an occasional writer for the show. Smallbone’s church “St. Savior in the Marshes” is a dwindling congregation, nearly bankrupt, in a crumbling historic building, and in danger of having to close its doors. Among the other key characters are Adam’s wife Alex (an attorney who’s not crazy about being the wife of a priest), a homeless alcoholic parishioner and Adam’s “mate” named Colin, an African lady named Adoha who is obsessed with Adam, the attractive school headmistress Ellie who is Alex’s friend and for whom Adam occasionally lusts, the lay assistant Nigel who wants to take Adam’s job, and the sarcastic and prissy archdeacon Robert who puts pressure on Adam to make the feeble church viable. I must say that there is a lot to find offensive in this show, and I would by no means recommend it without reservation to just anyone. It certainly is not for anyone who is immature and easily offended. What fascinated me most about the show is its depiction of the state of the Church of England in “post-Christian” England. Smallbones is a priest who thrives on social justice, counseling drug addicts, caring for the homeless, all the while smoking and drinking and swearing like a worldling. He performs the “mass,” speaks to God in irreverent mental prayer (which the viewer overhears), but never mentions Christ or the gospel. Despite the liberal tripe, every once in a while, I must admit, there is something in the writing that shows a deeper level of understanding about Christianity and ministry that is striking. Take the episode when Adam joins with a “successful” young minister in a misguided effort to offer a “contemporary service” to help boost St. Savior’s dismal attendance (season 1; episode 2: “Jesus is Awesome”); when Adam feels jealous over the success of a “celebrity” pastor (season 1; episode 4: “The Rival”); or when Adam’s commitment to the church strains his marriage and alienates his wife (season 2; episodes 6-7). The show’s first season ran in 2010 and its second in 2011. I recently noticed that Hulu posted the six episodes of the third season, which ran in the Spring of 2014 in the UK, and I started watching them. The third series seemed to start off with a complete capitulation to liberal propaganda. In the first episode Adam works with a local Muslim imam to refurbish a community playground and the Muslims are (of course) presented as more generous and moral than the “Christians.” Sadly, the second episode has Adam giving over his scruples to canon law and performing an unofficial gay wedding. OK, I was more than ready at this point to write the show off and see it simply as a cautionary tale for what liberal theology does to the church and society. Still, the binding hook was the curiosity as to what would happen to St. Savior. Would the doors be closed or would Adam find a way to save the church? Then came series three episodes 5 and 6. All I can say is that, despite myself, I found these episodes to be very moving. After a moral failure that is blown out of all proportion through gossip and malice, Adam is unceremoniously removed from his church and St. Savior’s is eventually closed. Adam is spurned and abused by the people he had committed himself to serve and decides to get out of the ministry. He finds, however, that he has no marketable skills for the secular world and crumbles into a ball of depression. Adam’s experience is presented at the end of these episodes as a kind of passion play with Ralph Feines playing the Bishop/Pilate who removes him from office, Colin as a Peter who denies him at his time of trial, and Liam Neeson as an angel who comforts him in his trouble. It all concludes on Easter morning with only the slightest glimmer of hope at the makeshift baptism of Adam and Alex’s infant daughter. It’s hard to say exactly what makes those final two episodes so powerful. I don’t think you will really feel the impact emotionally unless you first watch the episodes that come before and see the characters developed. I say this with trepidation knowing one might watch some of the earlier episodes and ask, “How could this possibly be considered redemptive?” It’s only after you’ve seen how close these people have been to Adam and how he has prayed and sacrificed for them that their harsh, uncharitable, and shabby treatment of him hits home. Some of the viciousness of their words to each other is truly shocking. This is far, far, far from being in any semblance of the word an “evangelical” or even “Christian” television show. “Facing the Giants” it ain’t. Most conservative Christians like us would probably (justifiably) denounce it as ungodly from the get-go. But there is something profound in those last two episodes. I think this is the case especially if you have ever been a minister and served in a local church and been shocked by the pettiness and nastiness that can come out in people you’ve loved and served. As a friend once reminded me, “The ministry is about suffering. Jesus suffered and so will we.” For all its liberal, multi-cultural, gay marriage promoting messaging there is, nonetheless, an underlying theme in the ending of this series that is powerful and compelling.